With a “mind‑blowing beer selection” of over 800 beers (vintage, draft and bottle), this venue is a ‘hit’. Located in the heart of Little Five Points, this cozy restaurant with its hand-crafted wooden booths and exposed brick wall is the perfect place for a casual dinner of gourmet pub grub and a few glasses of one of the 44 beers on draft (including two hand pumps) or one of the 700 bottled beers available. The beer list is only micro-brews and small imports, offering pours not available at most local bars. Since its opening in 2008, The Porter Beer Bar has been consistently listed among the top ten beer bars in the world by ratebeer.com. The Porter had also been named “Best New Pub” and “Best Beer Haunt” by Atlanta Magazine. And Zagat has only compliments for this gem. 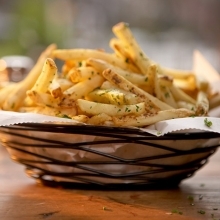 They serve Belgian fries and even mussels …. So there is no better place for our July’s Belgian THIRSTday … Join us on the 2nd from 7 pm. Parking: you can use metered parking along Euclid or a free lot behind the restaurant. From Euclid, turn onto Colquitt Ave and then turn right at the 3rd drive, which will take you to the back parking lot. Do not park on the upper level in the back lot. It is for the apartment buildings only and you will be towed! Other options include the pay lots by the Variety and free street parking on Washita and Seminole after 6pm.